Scientists at the United Technologies Research Center and UConn used advanced additive manufacturing technology to create ‘smart’ machine components that alert users when they are damaged or worn. The key to both innovations is the use of an advanced form of 3-D printing called direct write technology. Unlike conventional additive manufacturing, which uses lasers to fuse layers of fine metal powder into a solid object, direct write technology uses semisolid metal ‘ink’ that is extruded from a nozzle. The viscosity of the metal ink looks like toothpaste being squeezed from a tube. This process allowed the UConn-UTRC scientists to create fine lines of conductive silver filament that could be embedded into 3-D printed machine components while they were made. The lines, which are capable of conducting electric current, act as wear sensors that can detect damage to the part. Here’s how they work. Parallel lines of silver filament, each coupled with a tiny 3-D-printed resistor, are embedded into a component. The interconnected lines form an electrical circuit when voltage is applied. As lines are embedded deeper and deeper into a component from the surface, each new line and resistor are assigned an increasingly higher voltage value. Any damage to the component, such as wear or abrasion caused by friction from moving parts, would cut into one or more of the lines, breaking the circuit at that stage. The more lines that are broken, the greater the damage. Real time voltage readings allow engineers to assess potential damage and wear to a component without having to take an entire machine apart. 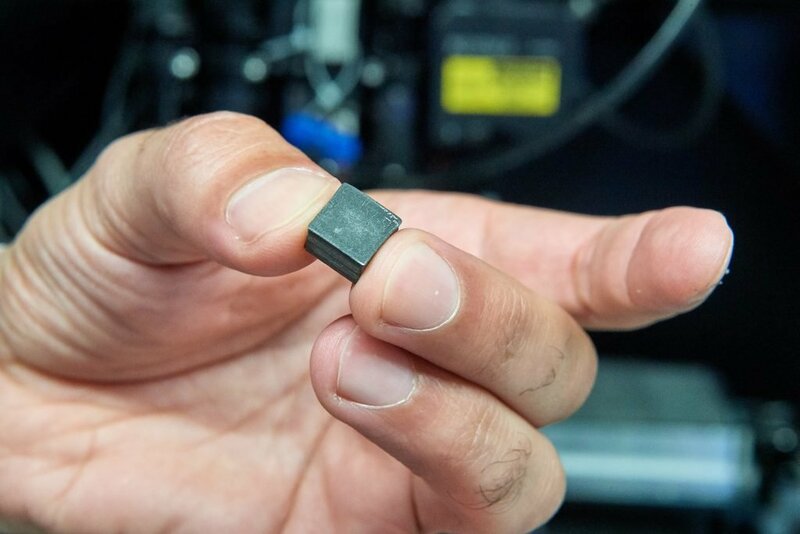 To get a better idea of how these micro sensors could be used, imagine them being embedded in the ceramic coating of a jet engine turbine fan blade. These blades are subjected to tremendous physical forces and heat. A microscopic crack in the protective coating could potentially be catastrophic to the blade’s performance, yet invisible to the naked eye. With the embedded sensors, mechanics would be alerted to any blade damage promptly so it can be addressed. 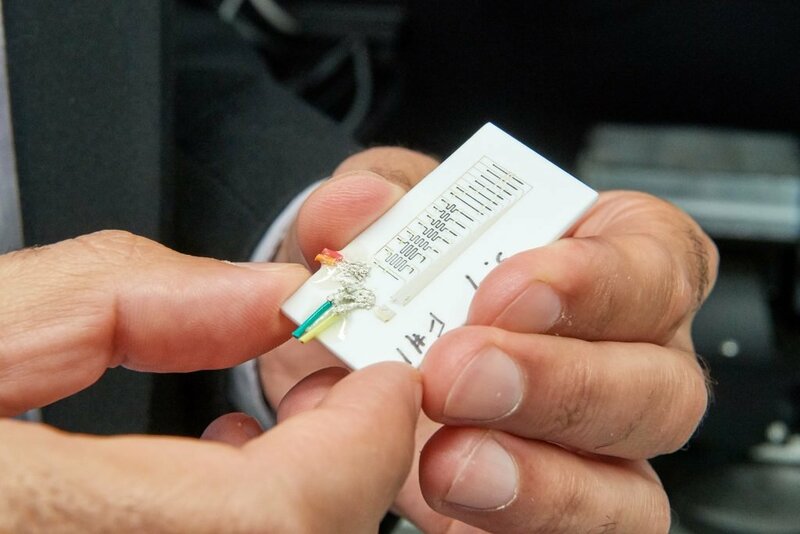 The UConn-UTRC team was able to embed sensor lines that were just 15 microns wide and 50 microns apart. That’s much thinner than an average human hair, which is about 100 microns. This allows detection of very minute damage. Developing such a precise sensor isn’t easy. UConn Associate Professor of Chemical and Biomolecular Engineering Anson Ma and a Ph.D. student from Ma’s Complex Fluids Laboratory, Alan Shen, measured and optimized the flow properties of the silver-infused ink so that micron-sized lines could be reliably deposited without clogging the nozzle or causing substantial spreading after deposition. The magnet fabrication method developed by UConn and UTRC significantly improves upon existing manufacturing practices in other ways too. Current methods for creating custom 3-D-printed magnets rely on high-temperature curing, which unfortunately reduces a material’s magnetic properties as a result. The scientists at UConn and UTRC found a way around that problem by using low-temperature UV light to cure the magnets, similar to how a dentist uses UV light to harden a filling. The resultant magnets exhibited significantly better performance than magnets created by other additive manufacturing methods. More detailed information about fabrication of the wear sensors can be found in an article in Additive Manufacturing. Details about the direct write production of polymer-bonded magnets can be found in an article in the Journal of Magnetism and Magnetic Materials.